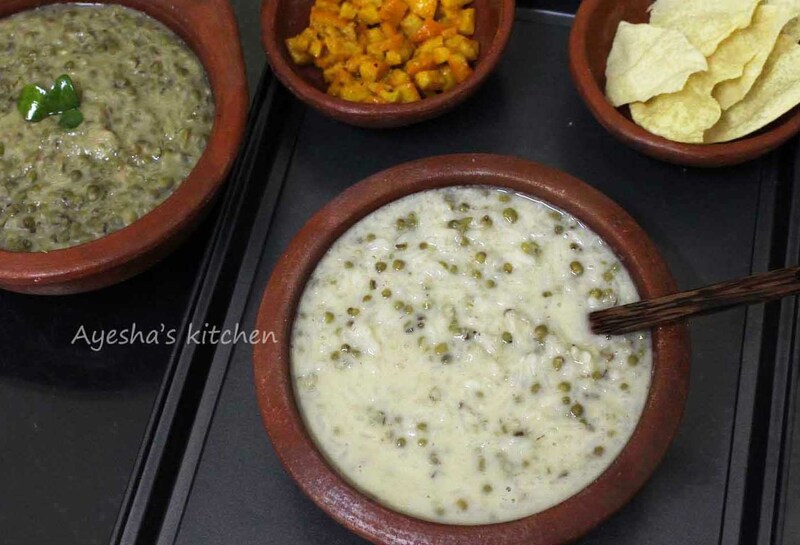 Gruel with green gram and coconut milk is a comforting nutritious dish from Kerala. This easy to make porridge is very healthy for both kids and adults equally. 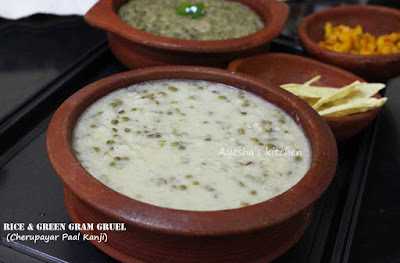 The people of Kerala (south indian state) call this gruel as cherupayar paal kanji and this is my favorite kanji recipe which i prefer for lunch at least once in a week. Kerala cuisine includes many delicious coconut milk recipes and this recipe for gruel is one of my family favorite coconut milk recipes. You can prepare this kanji/porridge in different ways. Some spice up this gruel with chilies and cumin. While some add onion, garlic and fenugreek seeds. Here am sharing a simple recipe for gruel with just a few ingredients. I know, many of us have an awkward feel to add such ingredients in gruel or porridge recipes. So do check out this one pot meal recipe showing how to make cherupayar paal kanji or green gram gruel. Wash well the rice and green gram. Then soak them together for one hour in 3 cups of fresh water. 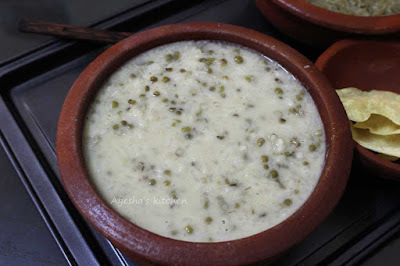 When done, transfer the soaked rice and green gram (cherupayar) along with the water to a pressure cooker. Add methi seeds (fenugreek seeds, optional only). Pressure it for 2 whistles. Remove from flame. Once the pressure releases, open the lid. Add salt. Mix well. Again turn on the heat over a medium flame. Mix very well. Do not allow it to boil after adding coconut milk. So switch off the flame before it starts to bubble. While serving add ghee or coconut oil over the prepared green gram gruel or cherupayar paal kanji (this step is optional and I skipped this). Serve hot along with pickle and pappad. Healthy and delicious.